During the centuries between Augustus, who founded the empire, through Constantine, who made it Christian, Rome gained in splendor and territory, then lost both. 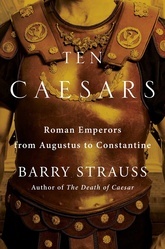 Ten Caesars is the story of the empire through the lives of the men who shaped it. The empire reached from modern-day Britain to Iraq, and gradually emperors came not from the old families of the first century but from men born in the provinces, some of whom had never even seen Rome. By the fourth century, the time of Constantine, the Roman Empire had changed so dramatically that it would have been unrecognizable to Augustus. From the lives of the emperors and the women who guided them to Rome’s enduring legacy, Ten Caesars charts a remarkable history in vivid, dramatic detail.